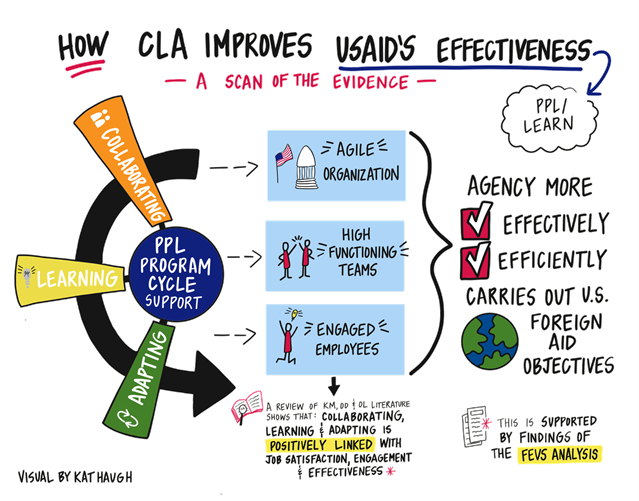 With the impetus to “do development differently,” USAID’s Bureau for Policy Planning and Learning (PPL) introduced the collaborating, learning and adapting (CLA) approach in 2011. This component of USAID’s “program cycle” guidance (on planning, managing and assessing its programs) has served to operationalize and strengthen processes of strategic collaboration, continuous learning, and adaptive management throughout USAID’s work in developing countries. A growing body of empirical evidence (described in part below) demonstrates CLA’s contribution to organizational performance. A key implication is that CLA policy guidance, capacity building and technical assistance to missions can be further leveraged to improve USAID’s workforce performance, enhance its organizational efficiency and increase overall effectiveness in achieving U.S. foreign policy objectives. Collaborating improves employee innovation, loyalty, and performance, and can create strategic alliances that leverage resource capabilities for significant savings in operating costs and increases in productivity(Roghe, et. al., 2012; CISCO, 2010; Dewar, et. al, 2009; Morgan & Berthon, 2008; Todeva & Knoke’s, 2005; Cassiman, et. al, 2002). In the public sector the U.S. Office of Personnel Management (OPM) identifies collaborative management as one of the five key drivers of employee engagement and successful management practices (OPM, 2016). Learning efforts, such as integrated M&E, learning agendas and communities of practice, build and use portfolios of evidence and support evidence-based decision-making, efficient problem-solving, and data-driven adaptations in organizations (Raimondo, 2016; Moreno, 2001; Wesley & Buysse, 2001; Wenger, 1998). Business sector research demonstrates that knowledge sharing is positively related to firm innovation capabilities, reductions in production costs, faster completion of new product development projects, and improved team and firm performance (Arthur & Huntley, 2005; Collins & Smith, 2006; Cummings, 2004; Hansen, 2002; Lin, 2007d; Mesmer-Magnus & DeChurch, 2009). Adapting in complex environments provides performance advantages to both public and private sector organizations, especially where adaptive management is driven by organizational learning (Akhtar, et. al, 2016; Valters, et. al, 2016; Jones, 2011; Allan & Curtis, 2005). The literature review confirms that USAID’s CLA approach incorporates practices that have proven valuable in a wide range of institutional contexts. But what of the USAID context in particular? Focused specifically on CLA practice in the USAID context, a recent analysis of more than 3,000 USAID employee responses to the 2016 Federal Employee Viewpoint Survey (FEVS) across 62 missions found evidence confirming the value of CLA. The study confirmed strong links among collaborating, learning and adapting in the FEVS and showed that they work in tandem within the context of USAID missions. This validates the Agency’s holistic approach, in which CLA’s components are mutually reinforcing. Even more important, the study found strong, positive relationships between CLA and indicators of organizational effectiveness: CLA was a significant predictor of employee engagement, empowerment, satisfaction, and perceived organizational effectiveness. A growing body of evidence from both private- and public-sector organizations recognizes employee engagement as critical to successful organizational performance (GAO, 2015; OPM, 2016) and suggests that employee and team empowerment helps to improve job satisfaction, commitment, innovativeness and organizational performance (Fernandez & Moldogaziev, 2013; Dizgah, et.al, 2011; Ugboro & Obeng, 2002; Kirkman & Rosen, 1999). CLA’s strong association with these indicators helps confirm the value of PPL’s CLA policy, capacity building and technical assistance support to missions. These efforts advance the practices and organizational environments that drive key performance metrics associated with the continuous improvement needed to more effectively and efficiently accomplish Agency goals. 1. See the Evidence Base for Collaborating, Learning, and Adapting: Summary of the Literature Review, April 2017 reference section for the full list of citations referenced in this memo.